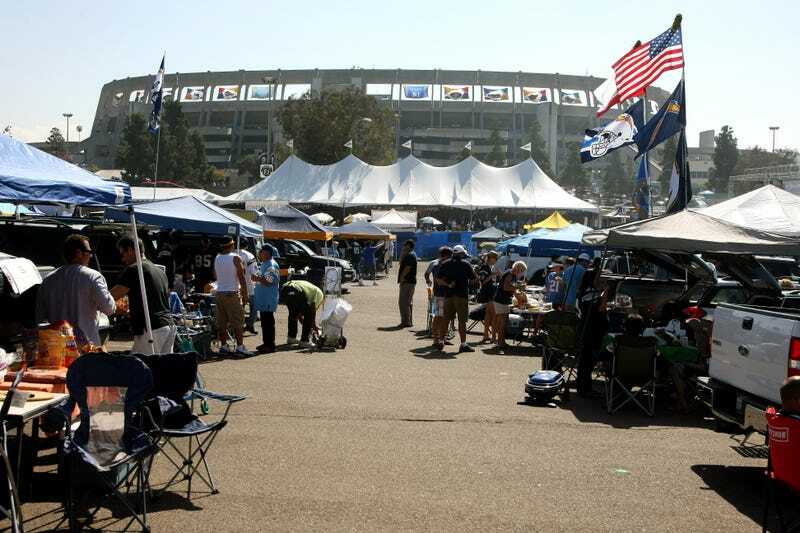 One would think that in the parking lot before an NFL game kicks off, a tailgater could mimic Philip Rivers and throw a football around with some friends. Not at Qualcomm Stadium, though. Jesse Unger was tossin' around the ol' pigskin at Qualcomm before the Colts-Chargers game last month when officers approached him and told him to stop. San Diego has a municipal law stating that one may not "intentionally throw, discharge, launch or spill any solid object (including footballs, baseballs, frisbees and other such devices) or liquid substance or otherwise cause subject or substance to be thrown, discharged, launched, spilled, or to become airborne." Unger kept throwing the football—because he says he thought the police were joking—and received a $280 ticket for "playing ball." Instead of paying, he took it to court. Last Tuesday, Unger stood in front of a judge, argued that the rules weren't publicly posted in the parking lot, and pled guilty to suspend the fine. His plea: "I plead guilty to throwing the football, Your Honor." The system works!